Their sheer number of Certified Architects demonstrates the synergy between NI and Bloomy Controls. 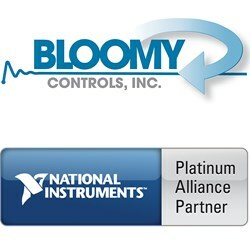 Bloomy Controls, Inc. (Bloomy) was awarded “Most Outstanding Technical Resources” by National Instruments (NI) at NIWeek 2013. This award is given to the National Instruments Alliance Partner with the most NI Certified LabVIEW and TestStand Developers and Architects. In addition, Bloomy was recognized as a finalist for “Regional Partner of the Year Award – Americas.” Bloomy has been an NI Alliance Partner for over 21 years, and continues to reaffirm the depth of its expertise in NI LabVIEW, NI TestStand, and embedded applications. Currently, more than 20 Bloomy technical staff members hold either Developer or Architect status, including 14 NI Certified LabVIEW Architects. The ability to draw upon this extensive level of competency and experience, using proven technologies from NI, has allowed Bloomy to deliver high-quality turnkey systems for automated test, data acquisition, and control. These systems include the Universal Test System™ and compactUTS™ mixed-signal functional test platforms, as well as Bloomy Energy Systems’ Battery Simulator 1200 and EnergyMAX™ power monitoring system. Bloomy Controls provides turnkey systems for automated test, data acquisition, and control. The company is a 21-year member of the NI Alliance Partner Network, maintaining the top-tier Platinum or Select status since the accreditation’s inception in 1999. The company has recently been named a Vision Specialty Alliance Partner, in addition to its 2012 inclusion as an Electronic Design Specialty Alliance Partner, by National Instruments. Bloomy Energy Systems, a subsidiary of Bloomy Controls, provides test and data acquisition products that enable battery, grid storage, and automotive companies to improve quality and reduce time to market for energy storage systems. Learn more about Bloomy Controls’ capabilities by visiting http://www.bloomy.com/. LabVIEW, National Instruments, NI, NI TestStand, NIWeek and ni.com are trademarks of National Instruments. Bloomy Energy Systems, the Universal Test System, compact Universal Test System, Battery Simulator 1200, and EnergyMAX are trademarks of Bloomy Controls, Inc. Other product and company names listed are trademarks or trade names of their respective companies.